Welcome to today's post! 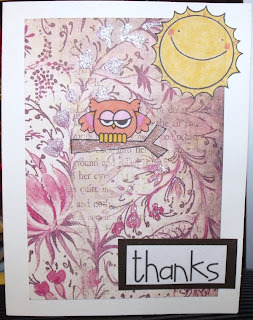 I have made here a lovely Thank You card using some of the FREE Digi stamps available at the Paper Smooches Blog site. This will be my entry for the Picture Perfect Sparks Challenge. The background paper is from "The Once Upon a Time Stack" from DCWV. 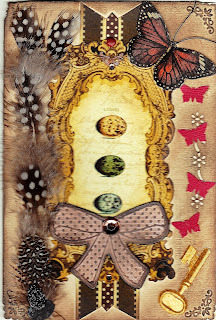 I love the reds and browns in the print as well as the woodsy feel it has. I also used some glitter glue to highlight some of the flowers in the background. 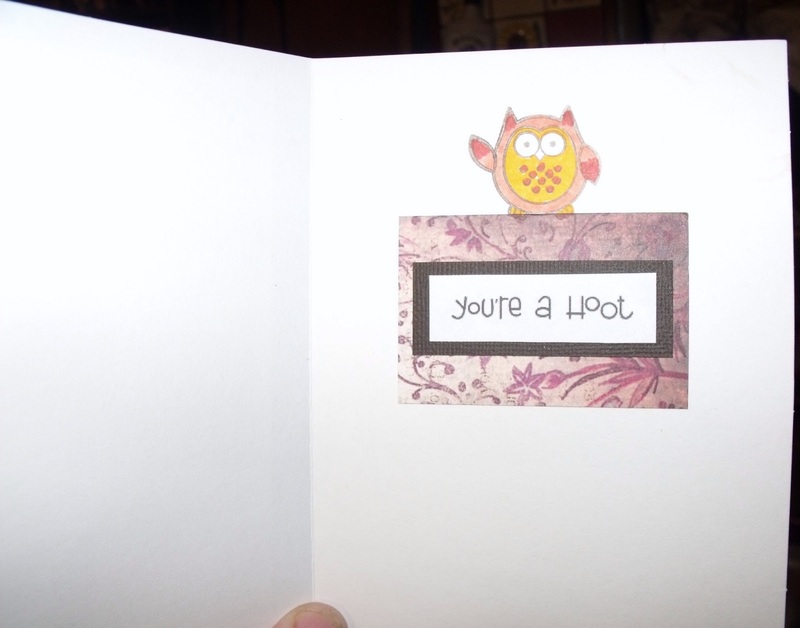 Inside the card is the follow through caption "You're a Hoot from the free Paper Smooches Digi Stamps. I stamped an owl from another stamp set inside the card because I liked the owl waving and I wanted a different pose on the inside. I colored my owls in with gel pens and alcohol markers. 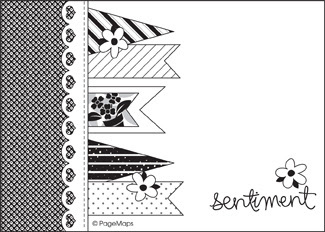 Thank you Paper Smooches for having some free digi stamps available to make some simple and easy cards! 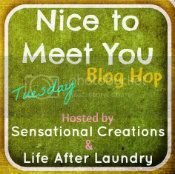 Thank you for dropping by! I love to hear from my fans. Please leave me a comment! I appreciate and read them all!! This Father's Day came so fast for me because the month of June is so busy for me with graduation, prom, ceremonies and outdoor BBQ's! So this year my post is late but I think this card would make a great Birthday Card for anyone at any time! 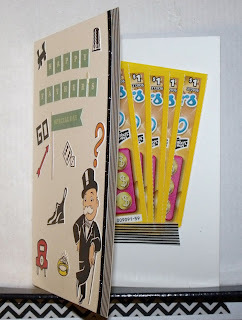 Especially for those who love gambling and lottery tickets! I know my Dad always loves getting scratch tickets so that's what was part of his gift card this year. I also gave him that amazing Lighthouse I crafted in my previous post. He loved it! This card was pretty simple and easy to make. 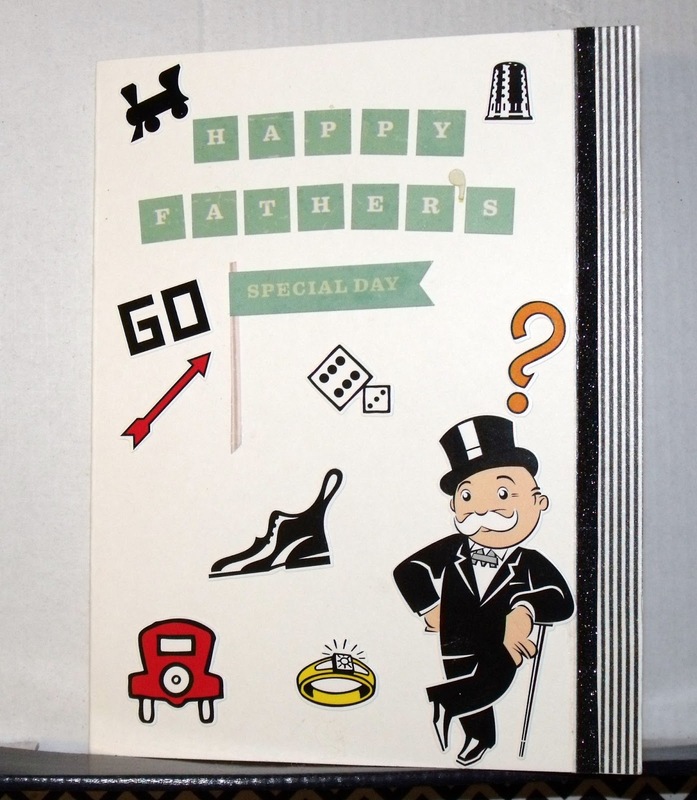 Right now there are stickers available in my local dollar stores by American Crafts that are the Monopoly game symbols. I was quick to pick up a few packages as I love the game! It occurred to me that my card could be focused on the "Chance" card from the game. So I fashioned it more towards that. 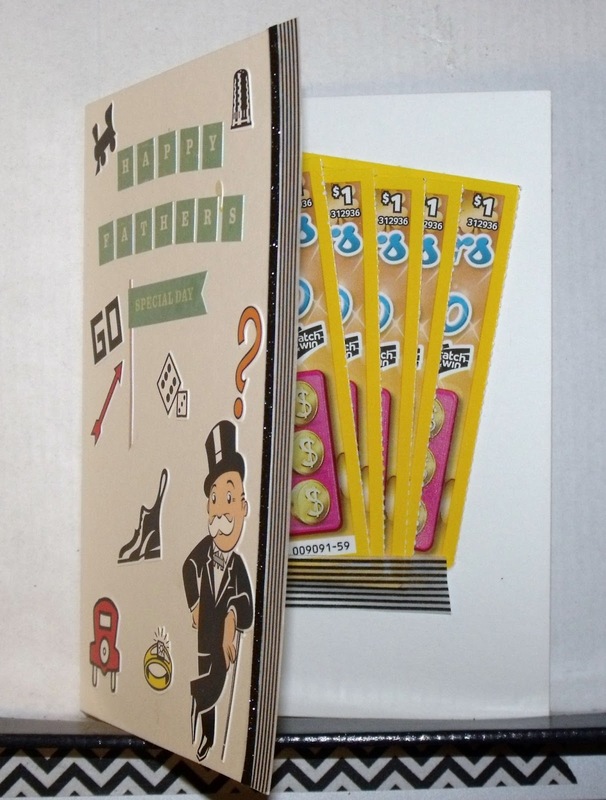 Inside I wrote my special sentiments to my father but hid them under the fan of lottery scratch tickets I stuck inside using double sided sticky tape from American Crafts! It was pretty easy for him to remove the tickets as long as you just stick the backs of the tickets to a small corner so they don't tare off when removed. Once the tickets were taken off then he got to see his special message! In this second photo you can see that I used some washi tape on the bottom to just be sure they stayed on and it was easy to lift it off again to get to the tickets! A really handy use for washi tape!!! I also used a thin line of glitter paper and a line of washi tape on the right front edge of the card... it made it look upscale, rich and classy! It turned out to be a great gift card and Dad won a prize too! 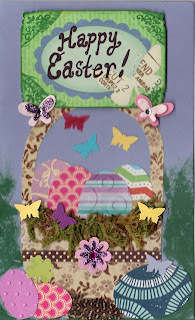 So always be on the lookout for great craft and card ideas at your local dollar store. You never know what kind of neat projects you can make and save a few dollars while you're at it too! This card was a Win/Win project! Please leave a comment below! I'd love to hear what you think!!! Thank you for coming over to visit with me today! Back in May, May Arts Ribbon put out a call for people who were interested in participating in a Nautical Summer Craft Challenge and I was pleased to be one of the people chosen to participate. The summer challenge was a Nautical theme and I was sent 2 different types of ribbon and 1 type of cording to use in my project. I had already wanted to make a lighthouse and this challenge was perfect for my project!!! I really had a lot of fun with this challenge and it really turned out great! The Canadian Flag does swivel in the wind as it is attached to one of the ropes (threads) that was used to make the flag pole. It made taking pictures a challenge as the flag was always changing it's orientation! 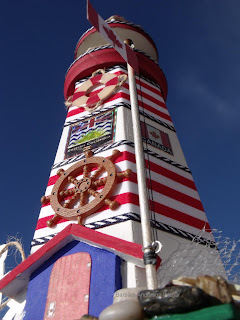 I took quite a few pictures of my lighthouse down at the beach front in Qualicum Beach, BC on June 12th and it was so hard to choose just one so I'm posting only a few of the best! This lighthouse was originally made to be a birdhouse and it had two holes in the front panel but I covered them up. I would think that one could convert this into a money bank by sawing a slot in the back prior to painting etc. because it's hollow and put a hole in the bottom covered with something so that one could get their money out one day! I loved making this so much I plan to make quite a few more! It was super fun! I had so many compliments from passers by walking along the promenade at the beach!!! I found a dollar store wooden lighthouse. Sanded it with very fine wet/dry sandpaper (dry). Began wrapping ONE ply of the 3 ply burlap cord around the roof top and glued down to surface with Aleene's Original Tacky Glue only as needed (sparingly) and held down end bits myself by hand until dry.. didn't take too long. Shaved any unruly threads of burlap material to look neat. Wrapped cord around the railing pylons. Upper no pattern because that's a light post only... lower level is viewing deck likely so I made a crisscross pattern for more security. (logical) Same glue used to secure hidden knots and wrappings. Pre-measured appropriate lengths of Solid w/D.Stripes ribbon before cutting, then adhered to building using thin line of glue and pressing down at finished points until stuck down. precision of level lines corrected while glue still setting. Pre-measured lengths of Solid Stripes ribbon used on main body of the lighthouse I used American Crafts double sided sticky tape as the liquid glue would bleed through the thin ribbon. At the back of the lighthouse the tacky glue was used to make sure it did not come undone and dried opaque... not too unsightly but the AC 2x tape just wasn't a strong enough hold. Then the blue diagonal ribbon was over layered on top of that at each outer edge using only tacky glue. I glued on very small river stones from Michael's Crafts to the base. I placed dollar store Canada and BC Flag stickers on the main front walls. Made a Flag Pole with a small bamboo BBQ skewer, stuck on a bead at the top with glue, used Jewelry findings for flag pole rigging, thick black thread from Coats (cotton) for roping, printed off a paper Canadian Flag and used my 2.5" Xyron Create-a-Sticker to put the flag on the thread using two prints so it's double sided. (Flag can freely flutter in the wind!) Rigging does not move though..lol That was way too complicated for me. Finished off with Embellishments stickers from Jolee's boutique... Dimensional Stickers (Bon Voyage 50-50085) and (Sunglasses 50-40051) where oddly I found the starfish! Fish netting was used from river rock bag!!! coiled rope I used the burlap cord single ply. Front door cut from scrap of scrappy paper and glued on. pliers for jewelry, rounded and flat edge. I Made it to "May Stack-a-holic DCWV Card Challenge Top 10 !" 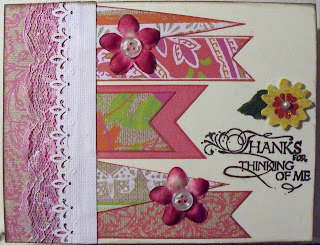 Today I am very excited to announce that I made it into the Top 10 list for the DCWV May Stack-a-holic Card Challenge!! I used 2 white (3 holed) buttons from Buttons Galore for the pink flower centers, used a Fiskars punch for the white paper trim and layered it over generic pearlescent 1" wide lace I purchased from a fabric store. The flags were inked in pink on the edges to highlight and match the pinks in the print. 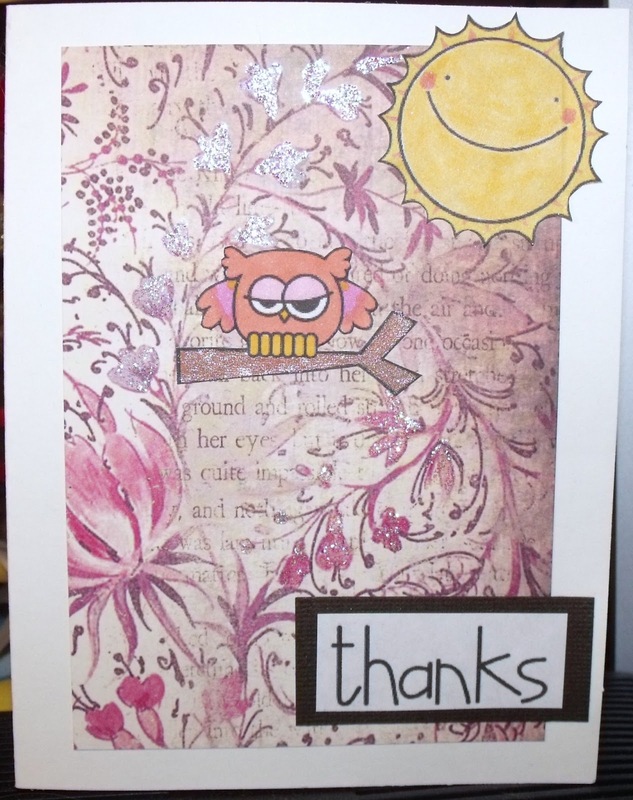 I used a generic "Thanks" stamp I found at Michael's Crafts. The outside edges of the card were ink distressed in chocolate brown. I am so thrilled to make it to the Top 10 List! It's been so busy lately as the month of May tends to be. This year is busier than ever! I have one child graduating from High School with Prom set for tomorrow and I'm registering both kids for College and University at the same time for this coming fall! This week I was set back by several days with an awful cold but Mom's job is never done. So after a few days of forced bed rest I'm just about better and fervently getting the last of the celebration preparations completed. The most critical is completing the alteration of my daughter's red satin prom dress!!! This card was quite simple to make and fun to embellish any way you like or put any sentiment you like. With so many Grad presents coming along I will surely need to make quite a few! I really appreciate your comments and look forward to hearing from you!